If you have an inconsistent pay schedule, saving money requires more planning and foresight. Here are a few ways to get ahead. It doesn’t take a money expert to know that having sufficient savings is incredibly beneficial (sometimes even life-saving). But despite all the benefits, saving when your income isn’t consistent can be a challenge. If you’re a freelancer, independent contractor, commissioned salesperson, seasonal worker or even an hourly employee with ever-changing pay thanks to an inconsistent schedule, saving money requires more planning and foresight than being a salaried employee. It isn’t as straightforward as automatically transferring a certain amount of each paycheck when you don’t have a consistent pay cycle and the amount you’re paid varies on a number of factors (how many clients you have, the number of hours you worked, etc.). As the economic landscape of the United States continues to change, this is becoming the reality for more and more people across the country. According to a report from Inuit, by 2020, contingent workers (i.e. people who work on a project basis or on contract) will make up more than 40 percent of the workforce. Sound like you? For those already in that camp, we’ve rounded up some steps to make saving as easy as possible when you have an irregular income. Before we delve into the nitty-grit savings tips, it’s important to make a bare-bones budget for yourself, even if it’s completely basic. In order to know how much you can feasibly save each month, you need to first establish what your lifestyle costs are. Use a spare hour or two this week to take out a piece of paper (or a blank page on Microsoft Word or Google Docs, if you prefer to work digitally) and write down all of your non-negotiable monthly expenditures. These include everything you have to pay for each month no matter, such as rent, food, transportation, childcare, etc. After listing each of these out along with their dollar amounts, add them up and write down the total. The figure you arrive to is the bare minimum you need to make every month to keep your head above water. If you wanted to be even more on the safe side and it’s financially feasible, tack on an extra 10 percent of that number onto the overall total as a buffer, just in case you overspend slightly or something unexpected arises. 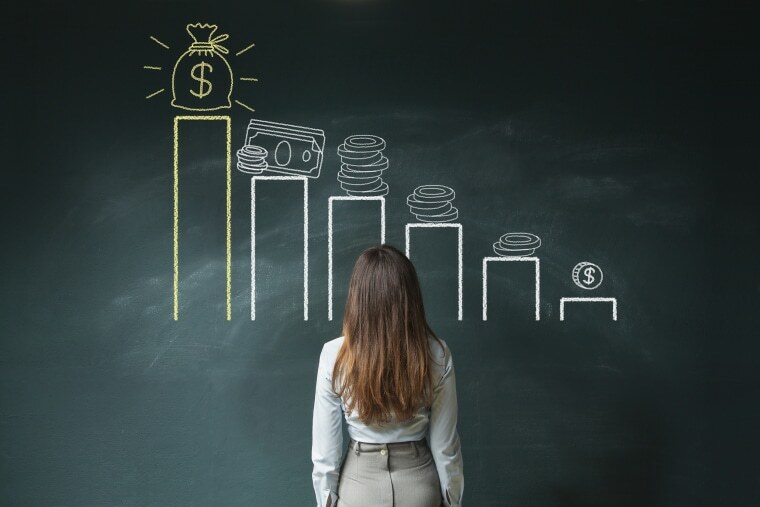 Once you have a better sense of what your baseline income should be, you’ll be much more equipped to start a roadmap for your savings goal, or know if a goal is even feasible for you right now based on your financial circumstance. Once you’ve calculated your monthly financial priorities, use the helpful methods to save money even if your pay fluctuates. Take a good look at your budget. Is it possible to cut down how much you’re spending in certain areas, like your food or housing-related costs? Consider eating at home more, or reducing your meat consumption. After all, the price of meat usually jacks up the overall costs of meals; a study from the Journal of Hunger & Environmental Nutrition found that sticking to a vegetarian diet could save you $750 per year. Beyond your food consumption, find ways to downsize your expenses. Put yourself on a clothes-spending freeze, or start relying on public transportation whenever you can. Consider taking a good luck household bills, too: your landline, digital and magazine subscriptions, streaming services, energy costs, etc. If it’s possible, try and decrease your spending whenever you can (even if temporarily), and use the money you save towards savings so you can hit your financial goals faster. Since you now know how much you need to cover the basics and survive every month, whenever you make more than that amount, simply put all or some of it away in savings. Start by moving that surplus money to a savings account after all of your non-negotiable expenses have been paid for each month. Of course, you want to be absolutely sure that you’ve earned above your baseline before you save anything. That way, you don’t have to worry that living beyond your means, since your necessities have been accounted for. If you’ve been consistently making more than your essential expenses for the past couple of months and expect it to remain that way, automating your savings is a painless and easy way to save a certain amount of money every couple of weeks or month. But, since your monthly income might still fluctuate, take stock of what you can afford to save regularly. Every month or few months, set up a recurring transfer from your checking to your savings account for however much will be doable for the next period. The actual amount you save depends completely on how much you estimate you can reasonably set aside, based on your previous earning trends. Thanks to the digital age, there are many apps available to help make all facets of your life easier, including managing your finances. If you’re not in the position to automate your savings or limit your monthly expenses, try using an app like Digit or Qapital, which can be set up to track your cash flow and automatically move money into a safe savings account for you every so often (as long as you have money flowing in and can afford to). Apps like these are a hassle-free way to build emergency savings without requiring any effort on your part beyond downloading the app and linking a bank account.